The HATTARICK is a -no rules, no limits- type ride... and therefore, NO EXCUSES. The worse the weather, the fatter the tires. 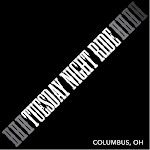 It's a social ride, not a race, but it's not for the faint of heart. The ride starts in Nelsonville, OH, at a Hocking College parking lot…. next to the railroad track-bed. It's across the tracks, just west of their frontier village. Many are invited, but few hear the siren's call. RSVP not necessary, just show up. The prizes this year, same as last year. It's Ok to share this opportunity with like-minded... idio.... People.